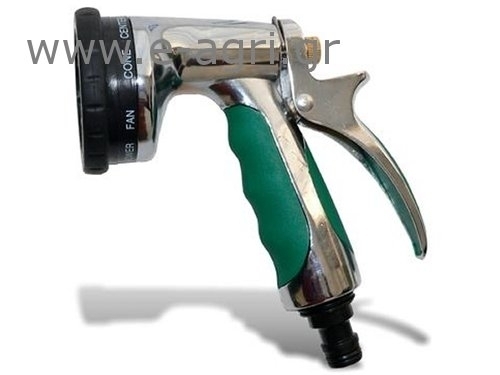 The Watering Spray Gun Irrile Pro combines an Ultra Tough zinc alloy body with comfortable soft touch ergonomics and a range of genuinely useful, class leading spray patterns. The Watering Spray Gun Irrile Pro combines an Ultra Tough zincalloy body with comfortable soft touch ergonomics and a range ofgenuinely useful, class leading spray patterns. Nine spray patterns : powerful Jet for cleaning, fast fill forfilling up buckets and watering cans, fine mist for seedlings, rose forgentle watering, fan spray for rinsing soap off cars, cone spray fordelicate watering and aerated.